the pink toque. a craft blog: Wedding Projects Completed! In my last post I had quite a to do list, and some of those items were time sensitive and revolved around my little brother's wedding coming up this weekend. I am happy to share the fruits of my labour -- a plush 4 tiered wedding cake made to be a near exact replica of what my brother and Holly's actual wedding cake will look like on Saturday. I also finished the small handbags/wristlets that I was making for each of the bridesmaids from the alteration scraps of my bridesmaid dress. They turned out a little smaller than I would've liked, but they were as big as I could possibly make them based on the scraps that I had to deal with. 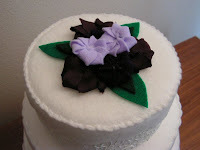 My mom is making Herman and Holly's wedding cake, so I tried to make my replica look as close to what she is designing from cake and icing as I could. 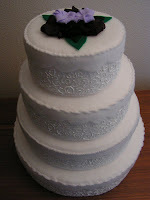 The cake is 4 tiers tall and made completely from white felt and every detail is hand sewed. 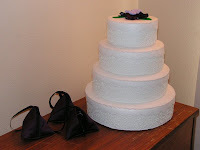 It features frilly white scalloped trim on each tier and I used white fabric paint to embellish the sides with the "lacy" design, much like my mom has done with icing for the real cake. @geeksoap and @thepinktoque on Twitter. A Hoosier girl living happily ever after in a geeky world. My Blogger craft blog HAS MOVED to the following address: http://www.thepinktoque.com/blog ... I make geeky soap at http://www.geeksoap.net too! I will no longer be updating here. For being a pink toque craft blog reader, you can get 25% off of the fabulous My Memories Suite software. Click the link below to receive the promotion. My Memories Suite (Standard Package) SAVE 25% off Regular Pricing ORDER NOW! graphics created by and copyright to lesley karpiuk (toque) of the pink toque craft blog. blog content, graphics, text and photos copyright ©2007-2008 by lesley karpiuk. all rights reserved.